Backlog Reduction: Please Tell Me! Galko-chan – Nigorimasen! When I noticed Hajimete no Gal (My First Girlfriend is a Gal) was among the dozens of anime series that started this month, I remembered I hadn’t finished another series with a “gyaru” main character: Please Tell Me! Galko-chan (available on Crunchyroll). I had watched some of it in early 2016 and I recall liking what I saw back then. 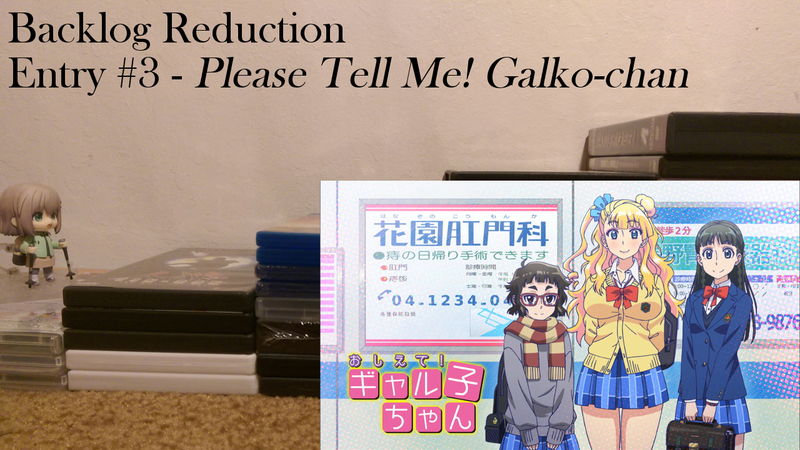 Galko-chan focuses on three high-school girls – Galko, fashionable and a bit impulsive; Otako, provider of scientific aspects of conversations; and Ojou, pure-hearted and sometimes misreads situations – and their diverse set of classmates including a plus-size futsal player, a tall girl who likes occult & horror, a friendly blond boy, and a soft-spoken baseball player. Many of the “is it true that…?” questions that drive the characters’ discussions involve female physiology, a subject area that was handled more discreetly than I initially expected. It’s set in a co-ed high school so there are a number of nervous interactions between the boys and the girls and those moments play out in a grounded fashion. 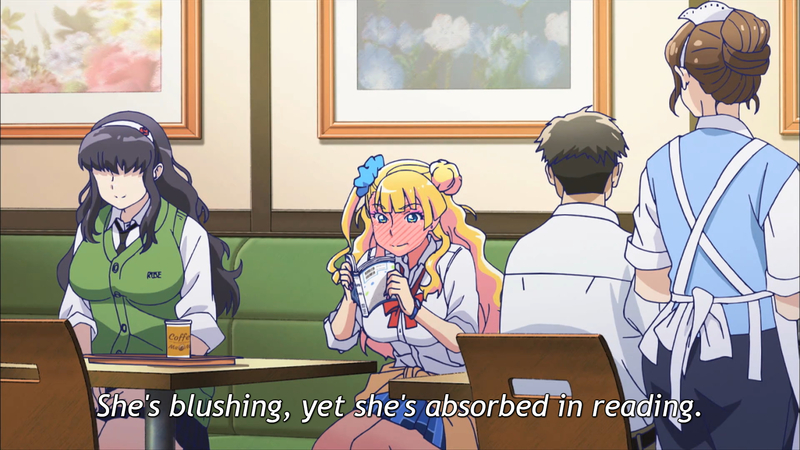 Galko and Otako’s friendship goes through a brief tough patch but they come out of it stronger; the pair was on a recent ANN list of female friendships in anime. A key theme throughout Galko-chan is “do not make assumptions about other people”, a feeling that also appears in its opening theme song lyrics. Galko may have the appearance of a typical “gyaru” but she is also a kind student who tries to help out her classmates. There are misunderstandings among characters based on overheard conversations, sounds, and smells. For example, Otako teasingly asks Galko for a rubber (ゴム, ‘gomu’), referring to a condom, and Ojou overhears them but thinks they were talking about hair ties until Otako whispers in Ojou’s ear what they were really discussing and causes Ojou to blush a lot. Galko-chan is a positive series about overcoming teenage worries of perceptions and I recommend giving it a try if you have time for it. Each episode is eight minutes long, making the whole series a little over 1 1/2 hours in total. 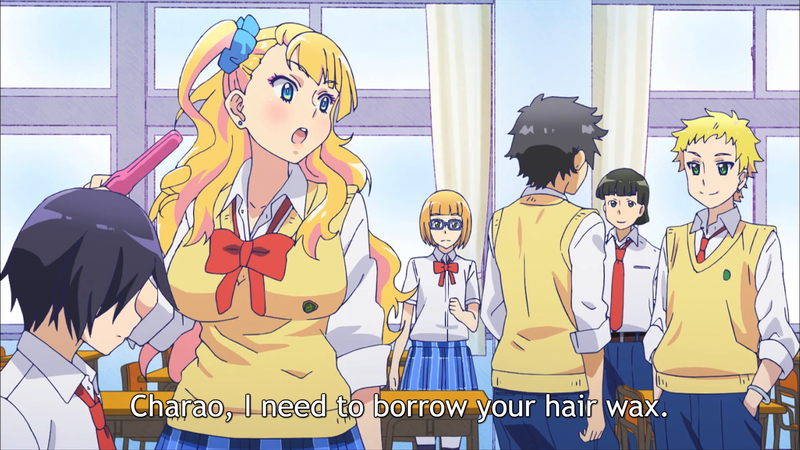 There are a couple male-gaze camera angles focusing on breasts when boys are around Galko but that’s to be expected with its high school setting. Tagged Anime, backlog, Backlog Reduction, Oshiete! Galko-chan, Please Tell Me! Galko-chan. I think your praise is not effusive enough. The direction in Galko was phenomenal. To be sure, it employed a lot of manga’s writing almost verbatim. But then how many adaptations fail at it? My favourite example is the uterus, when everyone plays their classic roles. Otako steers the conversation to the uterus because she enjoys having Galko embarrassed. But she blows up upon her own petard as Galko fails to catch the hint, and turns the tables with follow-up questions. Otako barely steers the conversation out from the hole she dug, when Ojou’s innocence delivers coup de grace. The two habitually forgot that Ojou always hovers at the edge of the conversation. The tricky part was to introduce Ojou in a natural, sudden way, to show that she was there from the beginning.